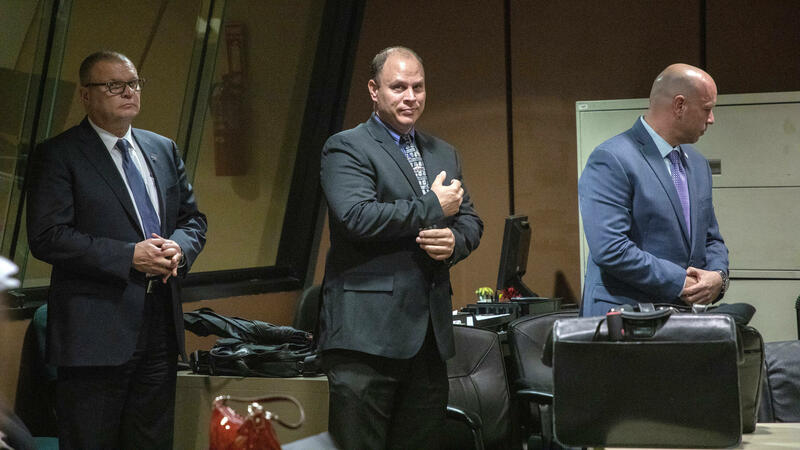 (L-R): David March, Thomas Gaffney and Joseph Walsh appear at a pre-trial hearing in Chicago in October 2018. Three Chicago cops were found not guilty of attempting to cover up the fatal police shooting of Laquan McDonald. Handing down her decision Thursday afternoon, Cook County Judge Domenica Stephenson attacked the prosecution's case, including its heavy reliance on police reports and an infamous dashcam recording that showed convicted Chicago Police Officer Jason Van Dyke shoot 17-year-old McDonald 16 times on Oct. 20, 2014. Officer Thomas Gaffney, former Officer Joseph Walsh, and former Detective David March were each found not guilty of obstruction of justice, official misconduct, and conspiracy. In a lengthy statement, Stephenson said it was reasonable to believe an attack was imminent and the shooting should not be viewed in hindsight. "It is not as simple as looking at the reports and comparing them to what was on the video," Stephenson said. The dashcam video showed McDonald walking away from Officer Jason Van Dyke just before the shooting. The recording sparked political upheaval and was later used to convict Van Dyke of second-degree murder and aggravated battery. Van Dyke is scheduled to be sentenced Friday. Beyond the video, Stephenson attacked the credibility of state witnesses and their heavy reliance on police reports. Notably, she called the testimony of Officer Dora Fontaine, a key state witness, "not credible." She also criticized state witness Jose Torres for not immediately telling police he witnessed the shooting. Prosecutors had claimed the police reports filed by March, Gaffney, and Walsh were part of a conspiracy to cover up for Van Dyke. Gaffney, Walsh, and March all waived their right to a jury trial and instead chose to have Cook County Judge Domenica Stephenson decide their fate. The trial closed Dec. 6 with none of the men taking the stand and their lawyers calling only one witness. Police reform advocates hoped Stephenson's decision will send a message that the so-called police code of silence will no longer be tolerated. Not guilty - that's the verdict today for three Chicago police officers accused of lying about the 2014 police killing of a Laquan McDonald. Prosecutors said the officers lied in an attempt to justify fellow officer Jason Van Dyke's decision to shoot McDonald 16 times. Prosecutors also claim that dashcam video proved the officers were lying. The judge's decision is a major blow to police reformers. They had hoped that this case would send a message about the so-called police code of silence. Patrick Smith of member station WBEZ joins us from the courthouse in Chicago. Hi, Patrick. SHAPIRO: Remind us who these officers are and what they were charged with doing. SMITH: Yeah. So you have current Officer Thomas Gaffney, former Officer Joseph Walsh and former Detective David March. Prosecutors said that these three officers collaborated with Officer Jason Van Dyke and others in the police department to shape a false narrative about the shooting of Laquan McDonald, that they - they said that McDonald attacked the officers, that they said McDonald injured officers and forced Van Dyke to shoot, things that are contradicted by the infamous dashcam video of McDonald's death. SHAPIRO: Now, this was a bench trial, which means a judge decided, not a jury. How did she explain her verdict? SMITH: Well, she really undercut the prosecution's whole case and undercut what I just told you. You know, seeing the dash cam video of the shooting seems to completely contradict what the officers put in their reports. What she said was that that video cannot be considered all of the evidence. And, in fact, the fact that it's not from the perspective of the officers themselves is a reason to almost disregard it. It cannot tell us what really happened. I mean, she was saying - the prosecutor said the video proves this whole case, and she said, no, video doesn't prove the case at all. DOMENICA STEPHENSON: Only the officers involved in the incident know what their belief was at the time of the incident. We cannot now view the actions of the officers with the benefit of hindsight as to what they should have believed. SHAPIRO: How have people in Chicago been reacting to this decision? SMITH: Well, you know, in the courtroom itself, I heard several police reform activists exclaim. You know, they said, wow, in this sort of disappointed disbelief. There are also a lot of police officers, police union members and supporters who were in the courtroom and cheered and congratulated each other on it. After, you know, the officers and the attorneys talked about their relief, activists talked about their concern that, you know, they were hoping this trial was going to send a message to officers that the code of silence - it's not OK to lie to protect other officers. And they were worried that this sent the exact opposite message. One people - one person who spoke after was Laquan McDonald's great uncle, Marvin Hunter. He was one of many people I heard who said that this verdict today is proof that the code of silence protects police officers, and it extends all the way up to the bench. MARVIN HUNTER: I want the Feds to come in I because I have no confidence in what has happened. I think the Department of Justice, I think the Feds need to come in. And I think they need to begin to investigate this for real, Cook - the whole Cook County justice system. SHAPIRO: Now, tomorrow, the officer who killed Laquan McDonald, Jason Van Dyke, is scheduled to be sentenced. What do you expect to happen then? SMITH: Well, yeah. There's a whole range of options. You know, the defense attorneys - Van Dyke's attorneys are asking that he be sentenced to probation only, no prison time at all. Well, prosecutors are saying he should be sentenced to 96 years in prison. Van Dyke was convicted of second-degree murder and 16 counts of aggravated battery. Prosecutors say he should serve the minimum for each individual count. Well, defense attorneys say, no, he shouldn't go to prison at all. He should be sentenced on second-degree murder, which there is a possibility in Illinois of probation for second-degree murder. SHAPIRO: Patrick Smith of member station WBEZ in Chicago. Thank you. SMITH: Thanks very much. Transcript provided by NPR, Copyright NPR.